A subatomic particle is a particle smaller than an atom. It may be either an elementary (or fundamental) particle, or a composite particle, also called a hadron. An electron is an example of an elementary particle; protons and neutrons are examples of composite particles. Dozens of subatomic particles have been discovered. Most of them, however, are not encountered under normal conditions on Earth. Rather, they are produced in cosmic rays and during scattering processes in particle accelerators. Researchers in particle physics and nuclear physics study these various particles and their interactions. The elementary particles fall into one of two classes: Fermions and bosons. It may be helpful to think of fermions as "pixels of matter"—fundamental particles normally associated with matter. Bosons, on the other hand, may be thought of as "pixels of force"—particles associated with fundamental forces. By combining these basic components, an essentially unlimited number of composite particles can be assembled. With the development of quantum theory, chemistry began to be explained in terms of the arrangement and behavior of electrons in the mostly empty volumes of atoms and molecules. The study of the arrangement and interactions of protons and neutrons in atomic nuclei lies in the domain of nuclear physics. The study of subatomic particles is called particle physics. Given that many subatomic particles are created in high-energy particle accelerators or cosmic rays, particle physics is also called high energy physics. Showing two protons (red), two neutrons (green), and two electrons (yellow). Early ideas about atoms portrayed them as the indivisible, fundamental building blocks of matter. Those ideas began to be shattered when, around the turn of the twentieth century, experimental evidence suggested that each atom is composed of smaller particles. In particular, experiments in electrochemistry led G. Johnstone Stoney to postulate the existence of a subatomic particle, the electron (denoted e−), in 1874. The existence of this particle was demonstrated in 1897, by J. J. Thomson. Later, it was realized that the electron has wave-like properties as well as particle-like properties, and this understanding led to the concept of "wave-particle duality" of elementary particles. In 1907, Ernest Rutherford performed an experiment (the gold foil experiment) that showed that the atom is mainly empty space, and that almost all its mass is concentrated in the tiny atomic nucleus. 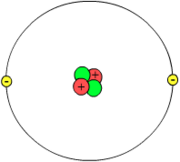 The nucleus of the hydrogen atom was found to be a proton (p+). Electrons, which are negatively charged, have a mass of 1/1836 of a hydrogen atom; the remaining mass of the hydrogen atom comes from the positively charged proton. The atomic number of an element corresponds to the number of protons in the nucleus of each atom. Rutherford postulated the existence of neutrons (n), and they were discovered by James Chadwick in 1932. The neutron is an electrically neutral particle with a mass almost equal to that of the proton. Different isotopes of the same atomic nucleus contain the same number of protons but differing numbers of neutrons. The word nucleon denotes both the neutron and the proton. The mass number of a nucleus counts the total number of nucleons. With the discovery of electrons, protons, and neutrons, it was thought that these were the indivisible, fundamental particles from which all atoms are built. That concept was also shattered when additional experiments led to the identification of many more subatomic particles. Around the same time, the concept that electromagnetic radiation is propagated in the form of continuous waves began to be challenged. In 1905, Albert Einstein proposed that the energy of electromagnetic radiation is quantized (that is, it comes in discrete amounts). With that, he began developing the modern concept of the photon as the fundamental unit of electromagnetic radiation. In 1909 and 1916, Einstein showed that, if Planck's law of black-body radiation is accepted, the energy quanta must also carry momentum ( ). This photon momentum was observed experimentally by Arthur Compton. In this manner, it was shown that photons have both wave-like and particle-like properties (although they do not have mass). Neutrinos were postulated in 1931, by Wolfgang Pauli (and named by Enrico Fermi) to be produced in beta decays (the weak interaction) of neutrons, but they were not discovered till 1956. Pions were postulated by Hideki Yukawa as mediators of the strong force, which binds the nucleus together. The muon was discovered in 1936, by Carl D. Anderson, and initially mistaken for the pion. In the 1950s, the first kaons were discovered in cosmic rays. The development of new particle accelerators and particle detectors in the 1950s led to the discovery of a huge variety of hadrons, prompting Wolfgang Pauli's remark: "Had I foreseen this, I would have gone into botany." The classification of hadrons through the quark model in 1961 was the beginning of the golden age of modern particle physics, which culminated in the completion of the unified theory called the standard model in the 1970s. The discovery of the weak gauge bosons through the 1980s, and the verification of their properties through the 1990s is considered an age of consolidation in particle physics. Among the particles in the standard model, the existence of the Higgs boson remains to be verified. This verification is one of the main research goals of scientists using the accelerator known as the Large Hadron Collider at CERN. All currently known particles fit into the standard model. There are a dozen fundamental fermions, also referred to as "12 flavors" of fermions. Six of them are called quarks, and the other six, leptons. In addition, there are four fundamental bosons, known as gauge bosons, and another two have been proposed in theory. The most common type of matter on Earth is made up of three types of fermions (electrons, up quarks, and down quarks) and two types of bosons (photons and gluons). For instance, a proton is made up of two up quarks and one down quark; a neutron is made up of one up quark and two down quarks. These quarks are held together by gluon particles. A boson is ephemeral and is easily created or destroyed. A photon of light is an example. A stable fermion, such as an electron in regular matter, is essentially eternal. The stability of matter is a consequence of this property of fermions. While creating a single electron is currently thought impossible, the production of a particle pair of matter-antimatter out of energy is an everyday occurrence in science and the more extreme corners of the universe. A gamma photon of sufficient energy, for example, will regularly separate into an electron and positron pair, which take off as quite real particles. When the positron meets an electron, they merge back into a gamma photon. A boson "pixel of force" going forward in time is exactly the same as when it goes backward in time (which is common on subatomic scales). They are identical. A fermion going forward in time is a "pixel of matter," while a fermion going backward in time is a "pixel of antimatter." They are exactly opposite each other, and when they meet, they annihilate each other and become an energetic "spin 1" photon. The fury of the atomic bomb dropped at Nagasaki would be matched if just 1 gram of matter united with 1 gram of antimatter. That the universe is composed entirely of matter (fermions going forward in time) is one of the great mysteries of cosmology. Theory suggests that in the hot Big Bang, the ratio of matter to antimatter fermions was 100,000,000,001/100,000,000,000. After the mutual annihilation phase, the matter fermions that remained gave rise to matter in the universe. Bosons come in a wide range of sizes, from large to small. 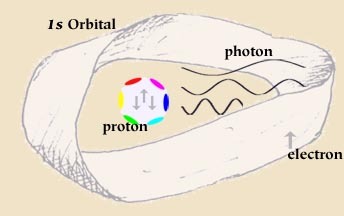 A radio wave photon can stretch for miles, while a gamma photon can fit inside a proton. By contrast, fermions are so ultra tiny that current experiments have placed only an upper limit on their size. The electron and quark are known to have a diameter of less than 1/1,000,000 the diameter of a proton, which itself is 1/10,000 the size of an atom. Although electrons and quarks may be described as "pixels of matter," they do not contribute much directly to the spatial extent of matter—they contribute only indirectly by their overall history over time, as directed by the quantum wavefunction (or orbital, as it is called in atoms and molecules). This aspect of matter encapsulates all of what is called "quantum weirdness," and there is much disagreement in the science world as to how to translate the concepts expressed in precise, universal mathematics (that scientists agree on) into the fuzzy concepts of a natural language, such as English. In the theory of General Relativity, space and time are united as one, to form spacetime. While bosons and fermions have the same overall velocity, they move through the spatial and temporal components of spacetime in opposite ways. A boson, such as a photon of light, moves through space at velocity c (the speed of light) and moves through time with velocity zero. (This is why reversing time has no effect on bosons. This is not true for the Weak Bosons which are slow in space and fast in time, as they have mass. The W comes in both positive and negative time directions, the W+ and W-; while the Z, like the photon, is symmetrical in time.) The fermions people are made of do the opposite—they move through space with a velocity that, compared to the speed of light, is essentially zero. These fermions move through the time dimension with a velocity essentially equal to c—this is what is known as the passage of common time. (In one second, fermion-based beings cover the distance c in time and rarely approach even a tiny fraction of the speed of light in space.) When the fermions do speed up in space, however, they slow down in time. At speeds approaching c in space, these fermions will travel through time at speeds approaching zero. Thus the velocity remains equal to c in spacetime—just the spatial and temporal components of velocity have shifted, according to the theory of Special Relativity. Fermions are essentially eternal, but they are not static, they interact with each other. They do this by exchanging or coupling with the ephemeral bosons they are able to generate. The consequence of such exchanges of bosons between fermions is what science calls the "four fundamental forces:"
The exchange of photons of light underlies the electromagnetic force. The exchange of gluons is the color strong force that confines quarks within protons and neutrons. The weak force involves weak bosons. Unlike their photon and gluon cousins, these bosons have mass and are slow in space so do not get very far away from a fermion, even on the scale of the proton. This sluggish behavior plays a central role in the slow and steady energy generation in the core of the Sun. Gravity is still a mystery and has been described either as a global phenomenon involving spin-0 bosons and spacetime curvature (Mach's Principle and General Relativity), or as a local phenomenon involving coupling with spin-2 cousins called gravitons. The final answer could well embrace both these perspectives. Everyday matter is made up of two types of fermions—quarks and electrons—and two types of bosons—photons and gluons. Each of these has a history that is determined, over time, by an abstract quantum wavefunction or orbital. The quarks are capable of creating and absorbing both photons and gluons, they have both electric and color charge. A proton (or neutron) is a composite subatomic particle that contains three ultra small quarks immersed in the intense field of gluons they have generated. The exchange of gluons is very vigorous and confines the quarks to a tiny volume: 1/10,000th the size of an atom. The energy of this "color force field" is large, and is responsible (by Einstein's equivalence of energy and mass) for 99.9 percent of the mass of the proton/neutron and hence is responsible for the mass of all material objects. The rest mass of the bare quarks and electrons together make up the other 0.01 percent. The size of the proton is that of this gluon field, while the much greater size of the atom reflects the much less intense photon field between the quarks in the nucleus and the surrounding electrons. The electrons are capable of coupling with only photons. The energy in the photon field of the atom is 1/1,000,000,000 of that in the gluon field and contributes little to the atom's mass. Although there are many fermions and bosons, a simple way to group them is in terms of three "families" in three "generations." The simplest member of the first family, first generation, is the electron neutrino. This is like a tiny Moebius-like twist in one of the spatial extensions of the Planck Scale "pixels of spacetime." This twist has a very fast spin and, being a fermion, it takes two revolutions to get back to its initial state. Next (second family, first generation) is the electron, which has spin and electric charge. (It couples with photons.) It can be conveniently thought of as a neutrino with a twist to it. Last (third family, first generation) is the quark, which has spin, electric charge, and color charge. (It couples with gluons.) It may be thought of as an electron with an extra twist that can go in two directions, the up and down quarks. All of these are moving in the "normal" direction of time. When they go in the opposite direction they are called antiparticles, such as the anti-neutrino, the anti-electron (or positron), and the anti-quarks. Antimatter can be readily created in the lab. When matter and antimatter fermions meet, they "untwist" each other and their energy is liberated as high-energy photons (gamma rays). The three "generations" of fermions can be thought of as non-oriented twists (Moebius strip) in spacetime. The first generation is based on the electron neutrino, which can be thought of as a quantum twist/spin in one spatial dimension. The electron and the up and down quarks are derived from this, as noted above. The second generation is based on the muon neutrino, which can be thought of as a twist/spin in two dimensions. The muon and the strange and charm quarks are founded on this. All members of this generation have more mass/energy than members of the first generation. The third generation is based on the tau neutrino, which can be thought of as a twist/spin in all three dimensions. The tauon and the bottom and top quarks are founded on this. All members of this generation have more mass/energy than members of the second generation. The photon, which is a (complex) wave in 1 dimension. The weak bosons, which are (complex) waves in 2 dimensions. The gluons, which are (complex) waves in all 3 dimensions. There is also the (theoretical) Higgs boson, which can best be thought of as a wave or excitation in 0 dimensions. Gravity can be described either as a global phenomenon involving the Higgs boson and the bending of spacetime, or as a local phenomenon involving the graviton or "spin-2" boson. The above illustration shows the components of the hydrogen atom (not drawn to scale). The proton at the center is made up of three quarks that have shed all their concentrated color charge into a halo of intense-colored gluons. If the quarks are considered on the scale of three fireflies, the overall proton would be on the scale of Manhattan Island. The quarks in the colorless center are just responsive to the photons. They couple with each other and with the distant electron. The electron (on the scale of another firefly) is in quantum motion in an abstract "1s" orbital (on the scale of the Solar System). Being a fermion, it has to make two full circuits of this orbital to end up as it started (as suggested by the Moebius strip cross-section). ↑ A. Einstein, "Zur Quantentheorie der Strahlung," Mitteilungen der Physikalischen Gesellschaft zu Zürich 16 (1916): 47. ↑ Arthur Compton, "A Quantum Theory of the Scattering of X-rays by Light Elements," Physical Review 21 (1923): 483–502. This page was last modified on 23 October 2015, at 15:43.